As you all know, Free Printables are one of my favorite things. I find myself enamored with one adorable thing after another, and now that Valentine’s Day is coming up, I’ve been pinning Valentine’s Day Free Printables right and left. How can I not!? From Disney to Nerdy, from Valentines to Home Decor, there are so many amazing and talented bloggers out there sharing their beautiful content. Honestly, a lot of the time I am overwhelmed by the things that other bloggers create. While I am over here wracking my brain and digging deep into the well of my creativity, it seems like others are able to create beautiful DIYs and free printables with ease! Add in the fact that I’m actually trained to do this, and that Graphic Design is my day job – and its a recipe for self doubt to be sure. But you know what? Its actually a good thing. I am constantly impressed by the bloggers in my friend circle and their impressive abilities. I don’t know if it comes easily to them, and even if it does – I still get the benefit of their inspiration. So really, it’s a win-win! To celebrate these amazing people, I’ve curated 30 of my favorite Valentine’s Day Free Printables here. A couple of them are mine, but most of them are from some of my favorite bloggers. I recommend that you visit and follow these talented people. You never know that the next gorgeous thing they are going to share will be! Share the Love- I’m beary happy you’re in my class! by C.R.A.F.T. Well? Did you find something to love? 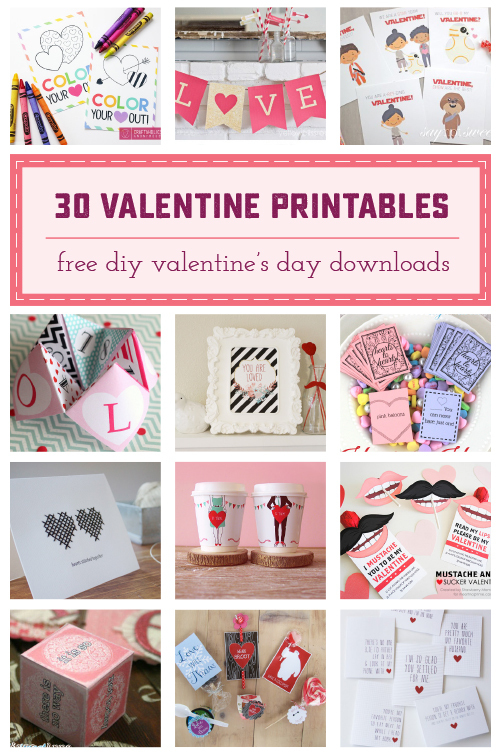 Start pinning some Valentine’s Day Free Printables of your own? I hope so! And if you have an absolute favorite that you don’t see here, share the link in the comments! I’ll be happy to add them to the list next year! !